As I mentioned on my 7/24/14 post, I decided to fish to sighted fish on Friday since blind prospecting delivered only one fish in 2.5 hours albeit a very nice rainbow trout. 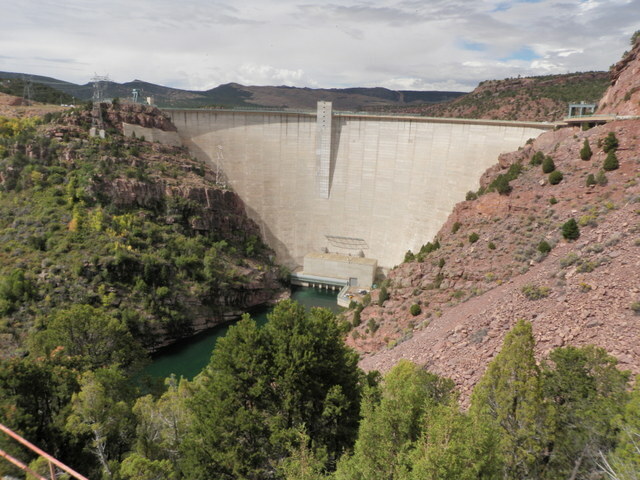 Friday was forecast to be another hot day with high temperatures in the 90’s, so we had a quick breakfast of oatmeal at the campsite, and then I took the Santa Fe and drove to the parking lot high above the boat launch just below the dam. Jane decided to stay behind as she made a concerted effort to avoid more snake encounters. I used my senior pass to cover the day use fee, and pulled on my waders and rigged my rod and began my descent of the steep Little Hole Trail to the Green River. There were quite a few rafts and boats lined up at the launch ramp already at 9:30AM, but I decided to hike for twenty minutes or so to get away from the launch traffic. As I walked along on the trail a steady procession of rafts floated by, and many rafters were laughing and shrieking as heated water fights commenced. I was very curious to know whether these youthful rafters could maintain their feverish pace for the entire seven mile float to Little Hole. After I hiked for 20 minutes I reached a nice area where a wide eddy of slow moving water presented three visible fish that were facing downstream. 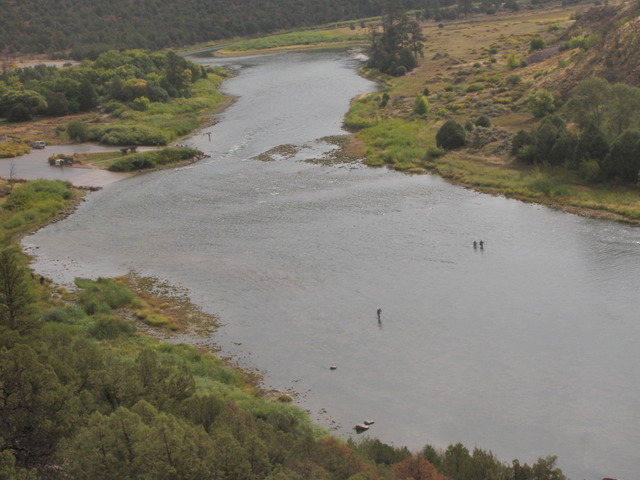 I picked out landmarks across from the positions of the observed fish and then waded upstream and began making casts to the areas where the fish held. Unfortunately each of the three fish scattered when I presented a fly in front of them. 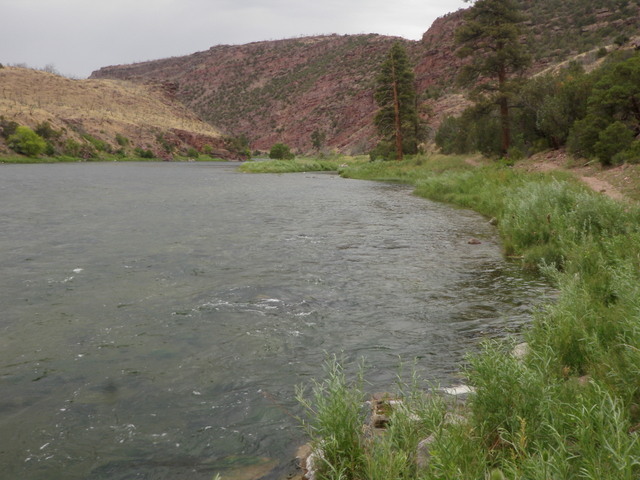 After I spooked the three fish at the start of my fishing day, I noticed several rises just off the main current seam that fed the huge pool and eddy. Upon seeing this welcome surface activity, I moved upstream a bit and began shooting long 30-40 foot downstream casts to the area of the rises. Finally on the tenth long cast a fish bulged and engulfed the size 12 gray stimulator with a zebra midge dropper. 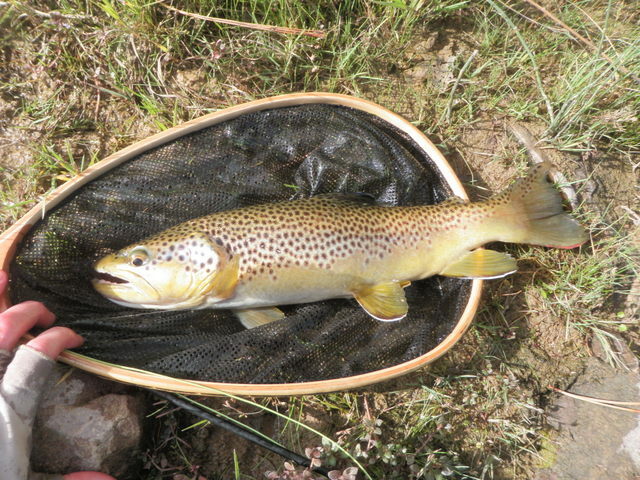 I set the hook and a strong battle ensued, but I was finally able to land a sixteen inch brown trout. I attempted to photograph my prize catch, but as I was gripping the fish to hold for the camera, I slipped from the slimy square rock I was standing on, and this momentary diversion allowed the brown to squirm free. I was hopeful that this experience was a harbinger of a morning of casting to rising fish, but that was not the case. I resumed sight fishing in the manner described earlier. I walked the path and looked for fish and then dropped down to the water and cast to visible targets. For the most part these fish were in slow moving deep pools above dense aquatic weeds, and they were quite wary. Generally these fish were not risers, but I attempted to target fish that were close to the surface and avoided fish that were hugging the bottom. Adding to the difficulty was the warm air temperature, the cloudless sky, and the constant commotion created by passing water enthusiasts. After landing the gorgeous brown trout I moved upstream a bit and stumbled across two fish that were once again facing downstream in an eddy. I worked these fish for quite a while as the brown trout closest to shore rose occasionally and sipped something small from the surface. During this time there were some strong gusts of wind, so I hypothesized that the brown was sipping ants that were blasted into the river. I switched my stimulator for a parachute ant and made a nice presentation in front of the fish. I held my breath as the brown finned up to the surface in a leisurely manner and pressed its nose against the fly and then returned to its holding spot. Once again my parachute ant had been refused! A second fish was further out in deeper water, and it circled in a small pool, but I was never able to generate even a refusal from this fish despite repeated casts. After spending half an hour on these obstinate targets, I turned around and scanned the water upstream, and I was surprised to see a splashy rise 25 feet above me and eight feet out from the bank. The parachute ant was too small to see, so I returned to the gray stimulator and zebra midge and dropped several casts in the vicinity of the rise. On the third drift I was surprised to see a swirl and instantly set the hook and felt the weight of a fish. The penetration of the hook point caused a nice rainbow to leap entirely out of the river, but before it splashed back down the fly came free, and I was once again frustrated in my attempt to land a nice Green River trout. I’ll never know for sure, but I’m convinced that this fish grabbed the tiny zebra midge because it didn’t feel like my fly had much penetration in the lip of the fish. Once again I slowly walked upstream on the Little Hole Trail and gazed into the water with my polarized sunglasses, and again I approached an eddy with several fish facing downstream but into the reversing current. Initially I spotted two fish, but as I stared into the water I eventually saw at least five trout in the 13-17 inch range. History repeats itself, and I suppose this explains why these fish also ignored my offerings. During the early afternoon time period more frequent episodes of strong wind gusts hampered my ability to look beneath the surface of the water, so I once again decided to change tactics. I was using my Scott six weight rod, and I’d placed the spool containing a sink tip line in my backpack, so I removed my floating line and loaded the sinking tip. For the last half hour on Friday I experimented with a damsel fly nymph and a conehead sculpzilla, but this tactic unfortunately also failed to excite any trout. I finally hooked the sculpzilla in my rod guide and walked back to the boat launch and then slowly hiked the steep trail back to the parking lot. 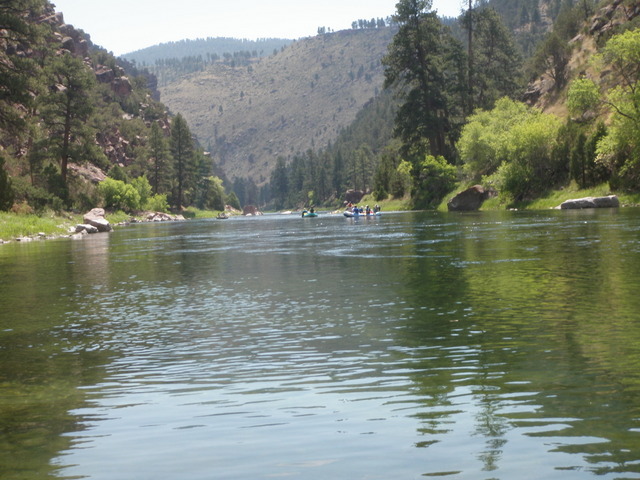 Once again I landed one nice fish in 3.5 hours of fishing, and the Green River was proving to be a challenging river in late July. I vowed to never return to the Green unless I was drifting the river or wade fishing early in the season when the blue winged olives cause a feeding frenzy. Jane and I planned a combination fishing and camping trip for July, and the date finally arrived. 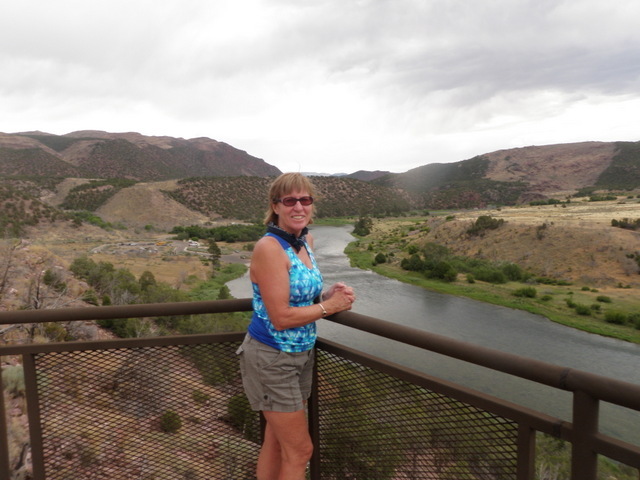 Originally I hoped to visit Flaming Gorge and then Strawberry Reservoir and end at the South Fork of the Snake River, but we decided that was too much for six days, so we eliminated the Strawberry Reservoir stay from our itinerary. 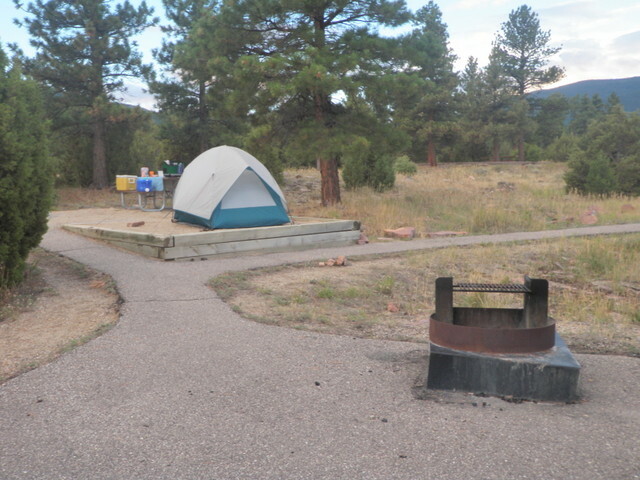 I used the online reservation system to reserve a campsite at Firefighters’ Memorial Campground in Flaming Gorge Recreation Area for three nights, and then Jane called the Hansen Guest Ranch in Swan Valley to reserve a room for three nights. Our trip would begin on July 23 and end on July 29. For lodging near the South Fork of the Snake River we originally considered the South Fork Lodge or The Inn at Pallisades Creek, but these proved to be too rich for our tastes, so we downgraded a bit. After three nights of camping we felt it made sense to stay in a hotel and gain access to showers and a bed. 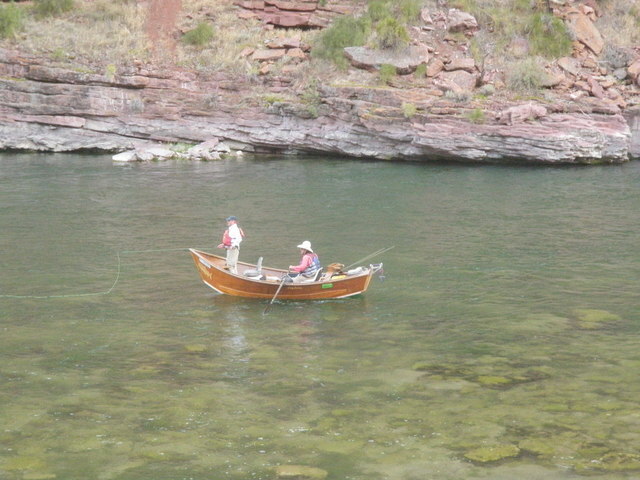 We packed the Santa Fe on Wednesday morning and made the seven hour drive to Flaming Gorge. We discovered that the heat wave that enveloped Colorado also rested over northeastern Utah when we arrived at our campsite on Wednesday afternoon. When we picked our campsite on the reservation system, it only offered sites on Loop C, and it was difficult to see what we were choosing. Upon our arrival we found site number 87 and discovered it was close to the highway, lacked shade and was quite near the neighboring site. We circled loop C and found site 80 was much more desirable and unreserved for our stay period, so we traded sites and left a note for the campground host. The other complication to the camping portion of the trip was our tent. 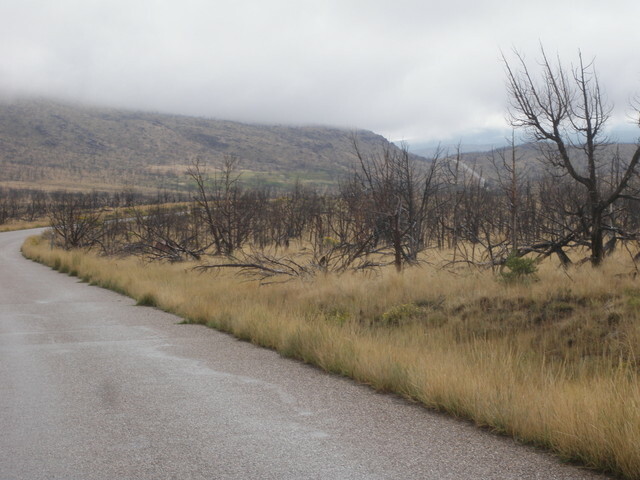 On a camping trip the week before, I experienced some severe winds ahead of a rainstorm, and the rain fly ended up sheared in five or six locations. We were unable to contact Eureka, the tent manufacturer, over the weekend, so we purchased a new tent from REI on Saturday. Before I departed for work on Monday morning I called Eureka and discovered that I could purchase a replacement rain fly for our Equinox 6 model tent. I placed an order for the rain fly and paid for overnight shipping, and sure enough the new covering arrived on Tuesday, and Jane returned the back up tent to the REI store in downtown Denver for credit. Once we determined that site number 80 was our home for three nights, we put up the tent and covered it with our new purchase. Our original rain fly was a silver cover, but we soon discovered that the replacement was gold even though the salesperson called it tan. After a quick dinner and an evening exploratory hike on the Bootleg Trail across from the entrance to the campground, we decided to crawl into our tent and read and then go to sleep. It was quite warm, so we decided to sleep on top of our sleeping bags rather than curl up in a toasty down cocoon, but it didn’t take long for the new rain fly to be put to a difficult stress test. For some reason the wind began to blow relentlessly and continued through the night. At one point I woke up and exited the tent and discovered the tablecloth had blown off the table and came to rest fifteen feet away. A towel was on the ground and the tent actually shifted several feet from its original position. The poles supporting the awning over the entrance were on the ground and the rain fly flapped repetitively against the tent. Much to our amazement, we were able to fall asleep again, and when we woke up on Thursday we took inventory of our belongings and found nothing missing. The rain fly had managed to survive the night and high wind without tearing. As the wind continued in the morning we repositioned the rain fly, and then I pounded stakes through the rings at the bottom of all the tent poles. When we shopped for a new tent, we discovered that all modern tents are equipped with stakes that hold the tent poles in place, so this became valuable information for our camping success. To start our day Jane and I took a three mile bike ride on the Bootleg Trail to the canyon rim and back, and then Jane prepared a tasty meal of eggs and cornbread muffins. We were now confident that the tent was secure, and my thoughts shifted to fishing. 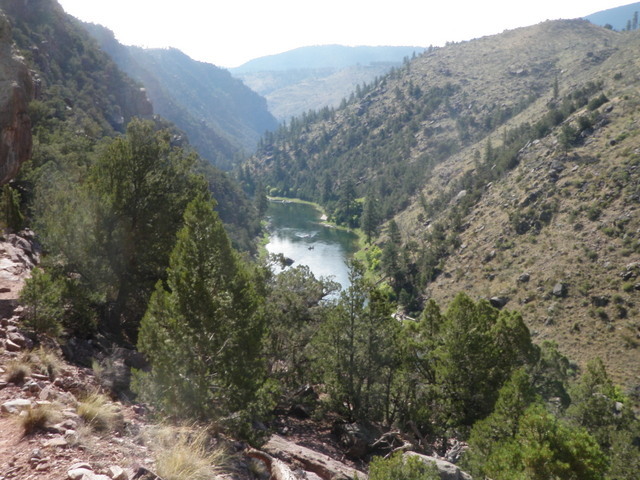 For my first day I decided to drive to Little Hole, seven miles below the dam, and hike up the river to fish. 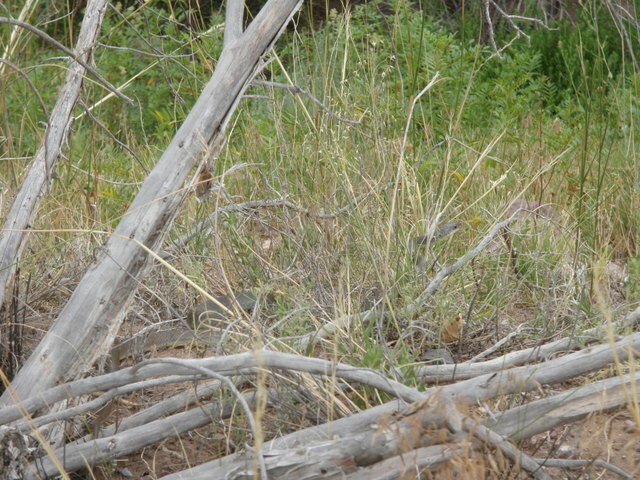 Jane decided to accompany me, but we hiked a short distance up the trail and encountered a long slender silver snake wrapped around the dead branches of a shrub next to the trail. 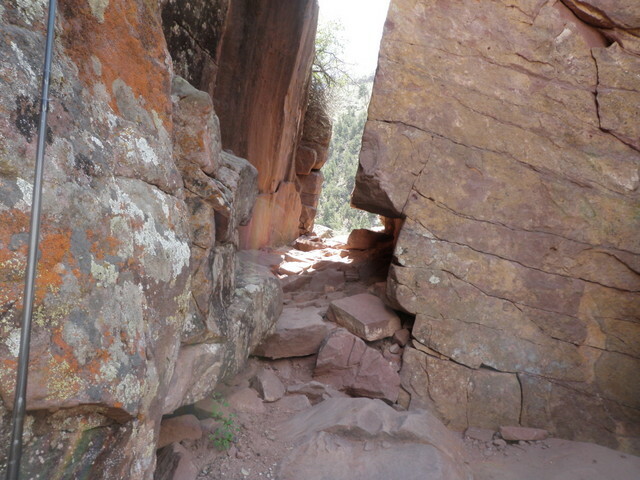 Jane is deathly afraid of snakes, so that would be the furthest penetration of the Little Hole trail for her, as she returned to the parking lot and the comfort of her book. We said our goodbyes, and I agreed to meet Jane back in the parking lot no later than 3PM. I was now by myself so I increased the pace and hiked for another twenty minutes until I reached an area that I remembered from my visit in September 2013. 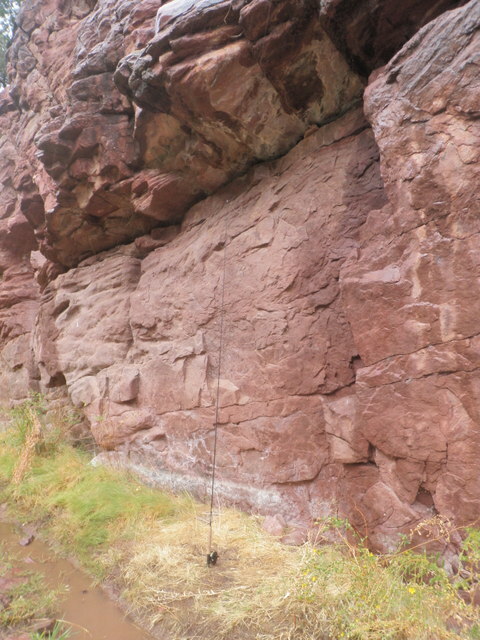 This stretch reminded me of the Arkansas River as the current swept parallel to a rocky bank, and there were numerous pockets and deep slots in the space in between. 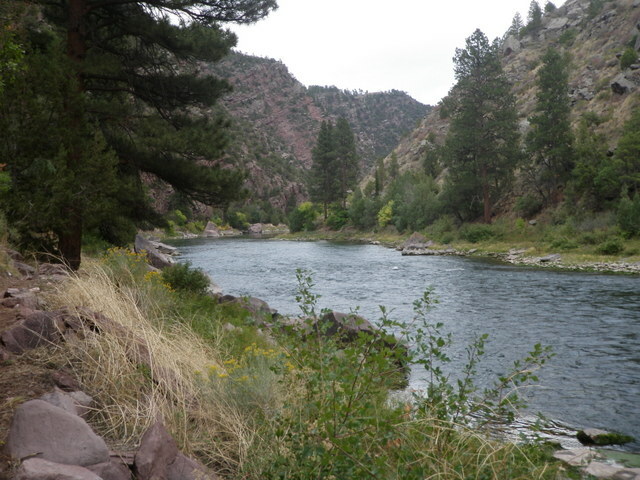 I decided to approach the river in the same manner that I approach this type of water in Colorado, and I tied on a Chernobyl ant, a beadhead hares ear, and a salvation nymph and began prospecting all the likely fish holding spots. After some time elapsed, I saw a handful of caddis on the water, so I swapped the salvation nymph for a bright green caddis pupa, but again my efforts were stymied. Unfortunately more time transpired with no success other than a rainbow that followed the Chernobyl ant as I lifted to recast. This all took place no more than four feet in front of me. My allotted time to fish was slipping away, and I wasn’t having any positive results, so I decided to change tactics and removed the dry/dropper configuration and replaced it with a size 12 gray stimulator. This took place just before my turnaround point. I began prospecting the same type of water that I was casting the dry/dropper to and in some swirling water along a current seam, the large dry attractor disappeared. I reacted with a timely hook set, and my line began spinning off my reel at a rapid clip. I allowed the fish to make a furious run, and when it slowed down, I applied a bit of pressure. This produced several acrobatic leaps in which the entire fish cleared the water, and I was now able to see the wide crimson stripe of a silvery glistening rainbow trout. Eventually I was able to tire out my noble foe, and I slid the net beneath the bright and hefty rainbow and then migrated to the bank for a photo. Catching and landing this fish was a thrill and totally unexpected given my lack of action before and after this episode. I glanced at my watch and realized I needed to start my return hike in order to meet Jane by 3PM, but as I walked briskly along the path, I observed closely to spot fish. I was quite successful in recognizing numerous fish in slow moving water hovering near the bank. In fact within .2 miles of the parking lot I noticed a pair of fish close to the bank, and I cast to them for a short while. Initially I drifted the stimulator, but that was ignored, so I clipped it off and tied on a small fur parachute ant. Surely with all the strong wind and with the fish positioned within several feet of the grassy bank,. the fish would jump on an ant! Unfortunately my strategy was a near miss, as the closest rainbow rose in the water column and put its nose against the ant only to drop back down to its holding spot near the river bottom. With that rude refusal firmly planted in my memory banks, I retreated to the parking lot and met Jane at 3:10PM. 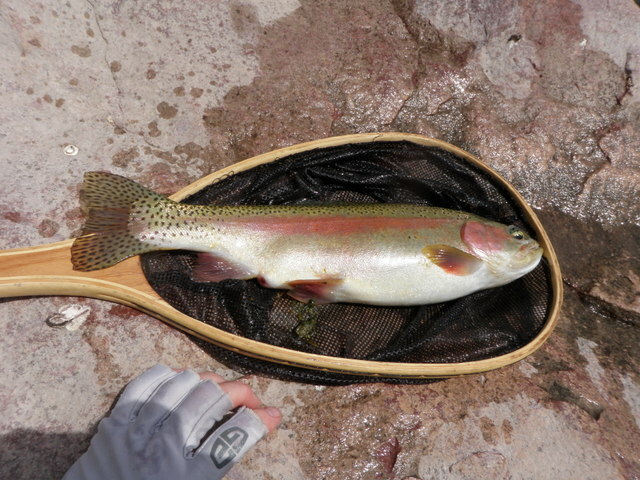 One fish in 2.5 hours of fishing is not great, but at least it was a fat 17″ brightly colored rainbow. 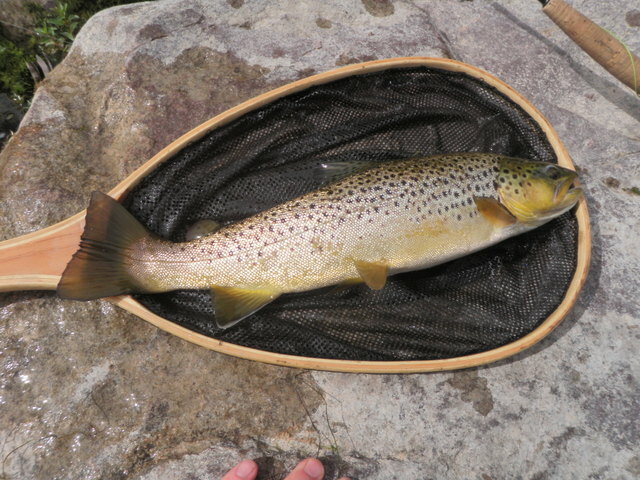 I decided to fish below the dam on Friday and to use my hard earned Thursday experience to my advantage and fish to spotted trout. Would this improve my catch rate? Stay tuned.